Spinspiration: Woolly Wednesday Gathering ... it's June! Woolly Wednesday Gathering ... it's June! Welcome to our Woolly Wednesday gathering for June, come and let us know what you have been doing with wool or fibres in the last month. All crafts and inspiration welcome.It's a little quiet here some months, we would love to hear from you. Have you been spinning, knitting, felting, crochet or taking advantage of shearing time and increasing your fibre stash! Please feel free to add the button to your blog's sidebar with a link to Spinspiration, a lovely way for us all to link together. Just copy the image to your desktop and then in your blog design - add a gadget, add picture - upload the picture and then add the url (http://spinwheelspin.blogspot.com/) and the image will link to here. 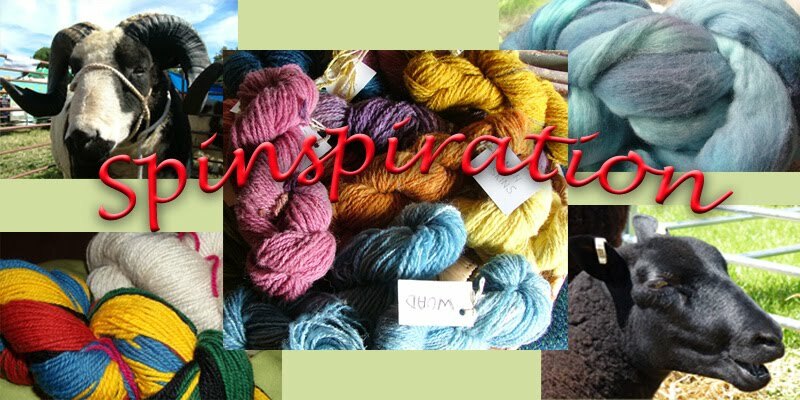 Join us with the linky below, link to a recent blog post of your woolly adventures in the last month or to a post in the month ahead, we look forward to seeing you, no time limits just join us when you can. Back soon!